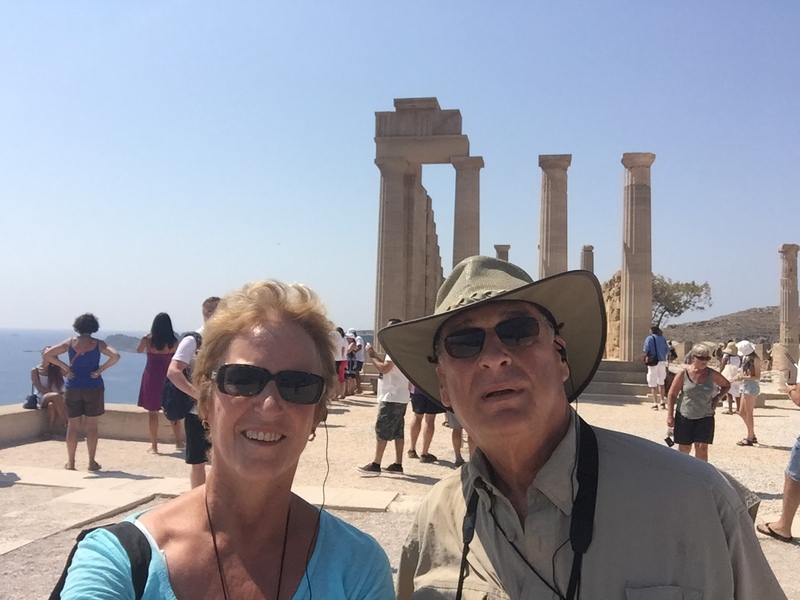 We arrived in Rhodes, Greece this morning and went on an excursion to the ancient town of Lindos. 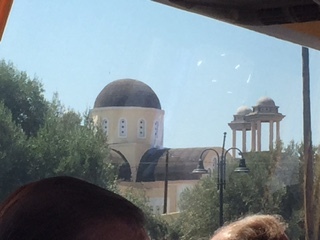 Along the way we heard about Colossus, one of the original 7 wonders of the ancient world (5 were Greek by the way). It was the same size as the Statue of Liberty. 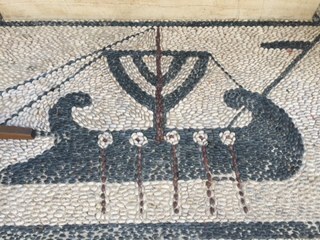 It was toppled by an earthquake in 225 BC and then the invading Arabs took and sold it for scrap metal. 7 by the way is a sacred number in Greek, lots of things go by 7’s and this is because they think of 3 as heaven and 4 as earth and so the sum, 7 is sacred to them. 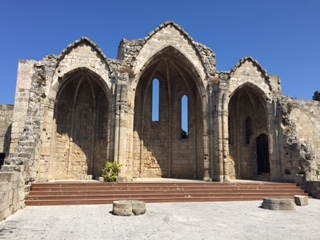 Rhodes (both the city and the island) became part of Greece in 1947. There are 4000 islands here, Crete is the largest and Rhodes is the 4th largest. 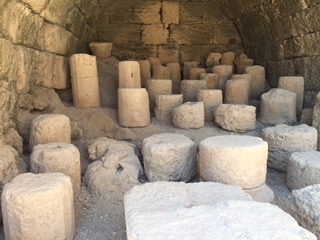 There are 500 types of olives grown here, many of the trees are over 1000 years old. They harvest the olives in the fall by spreading nets around the trees and shaking the trees until the olives fall into the net. Greece is the 3rd largest producer of olive oil and of course the tour guide told us (in typical guide humor) that Italy gets its olive oil from Greece and sells it as Italian. 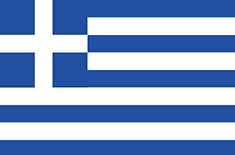 Very proud people, these Greeks. 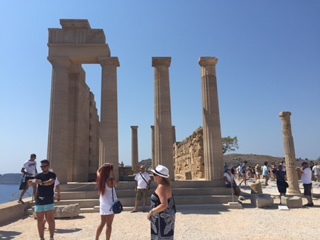 We drove along the coast about 30 miles to Lindos which is an ancient Doric town dominated by a magnifacent acropolis (which means high city – and every city has one). 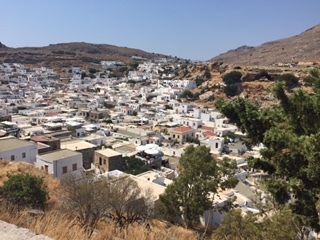 Lindos was once a very poor city up until about 70 years ago, and now its beauty has attracted tourists and it is a place for the rich. You can walk up to the acropolis or take a donkey up to the summit (we walked) and the views are breathtaking. 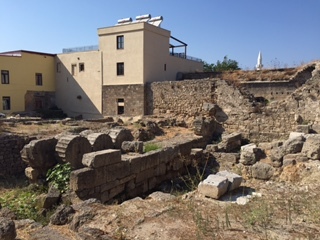 There are remains of a walled fortress built in the 15th century and the remains of the ancient Temple of Athena. 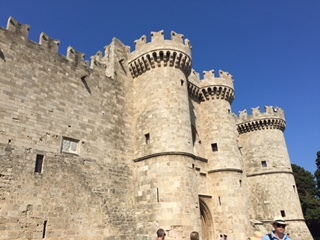 If you have seen the movie The Guns of Navarone, you will see Lindos, it was filmed here. 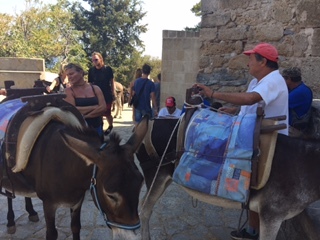 The donkeys you can ride up on – it is 300 steps to walk! 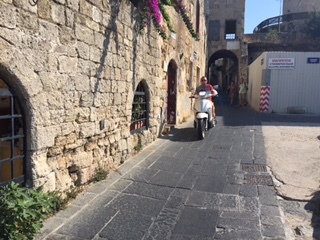 After our walk back down, we wandered the town and the shops, had our gelato (of course) and then headed to a ceramic shop (Savvos) that has been in the potter’s family for hundreds of years. 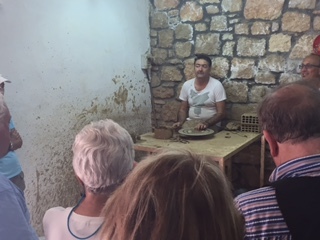 He did a demo and we enjoyed seeing all of the handmade ceramics. I bought a small bowl fired in yellow with olives painted on it. 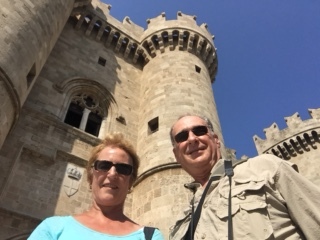 We had our lunch, and explored the city of Rhodes, named a UNESCO World Heritage Site in 1988. We walked all around inside the gates, explored quiet streets and noisy squares. 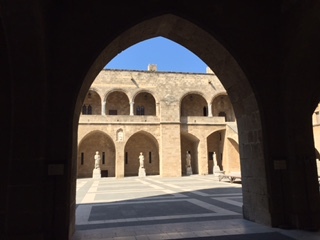 We saw the Grand Master’s Palace, originally a Byzatine fortress from 7th century AD and later housed the center of the Order of Nights. The pedometer said we did 70 floors and almost 8 miles of walking today! This is why scooters are good on these streets. 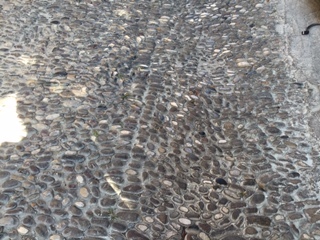 Many of the shops have this type of floor made out of stones. 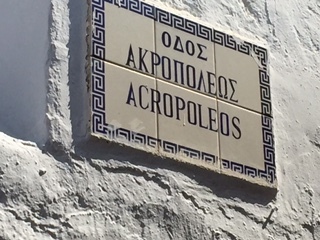 Since I have shown how other streets are paved – here is how they do it in Rhodes! We stopped to have a drink (and the squares are almost like a bazaar – with the proprietors calling out to have you come into their bar). They all have free wifi and I guess that helps them attract customers. 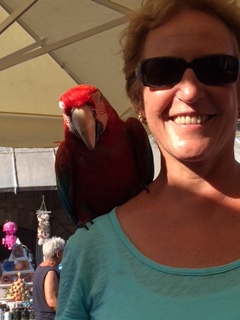 We enjoyed the people watching here and the resident parrot had to make friends with us. Norm talked to the young man who waited on us about the status of Greece, and he got very sad. 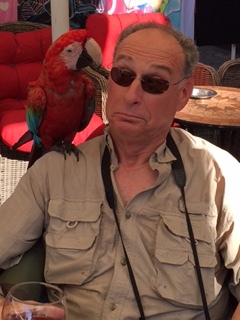 Wonder what that parrot said to Norm? This entry was posted in Europe, Excursions, September, World Cruise 1. Bookmark the permalink. Really impressed with your fitness and healthy eating – not many lose weight on a cruise. Just enjoying your blogging – you certainly see and do loads. Question: where have you had the best gellatto so far?